Here are some very good corn tortillas, that can be used to make your chilaquiles. You can also use these “La Costena Jalapeno Peppers" to make the chilaquiles’ salsa. They have a very good flavor and its hotness is extraordinary. The epazote really gives another dimension to the Mexican food. You have to use them in your chilaquiles, you will get amazed. Without a doubt this is one of the best dishes of all the Mexican cuisine. There’s nothing better than waking up and having for breakfast some tasty and spicy green chilaquiles accompanied with: refried beans , guacamole , peasant rice , quesadillas or any other appetizer. The chilaquiles consist of a plate with tortillas bathed in a salsa that is prepared with chili and more ingredients, in this case a green salsa is used, and then they are garnished with cheese, onion, Mexican cream, coriander and avocado. It is a magnificent combination of ingredients, flavors and textures. *It is funny but the Mexicans when they wake up with a hangover after going to a party where they drank a lot, they always look forward to relieve the hangover with some very spicy chilaquiles. We don’t know how good the remedy is but it is very popular. To make the chilaquiles first the tortillas have to transform into tortilla chips then the salsa is prepared, the ingredients are mixed and at the end they are garnished. The recipe is laborious but not difficult. If possible make the chilaquiles with old tortillas because they are drier, they absorb less fat and they come out crispier. In this recipe the tortillas are going to be fried and it is very important to use a vegetable oil since the olive oil is not good for frying dough. The salsa that is used in the chilaquiles is prepared with 1 jalapeno pepper although this quantity can be varied, depending on your spicy tolerance. Cut 8 maize tortillas into triangles, then set aside. Heat the frying pan oil over medium-high heat. Put in the frying pan the tortilla triangles that were cut and fry them for about 2 minutes, until they are moderately fried; move them regularly with a skimmer or with a slotted spoon. The tortillas are fried so the chilaquiles have more flavor. Transfer from the frying pan to some paper towels, with the skimmer or the slotted spoon, the tortilla triangles that were fried so they dry and the fat excess is absorbed; then set aside. Leave the tomatillos and the chili cooking in the boiling water for about 5 minutes, until the tomatillos turn to a lighter color. The Green Salsa that was prepared. When the salsa boils reduce to medium heat and cook it for about 5 minutes, until it thickens a little; stir occasionally. Reduce to low heat, put in the saucepan all the tortilla triangles that were fried and mix them with the salsa without breaking them. Cook the green chilaquiles for about 3 minutes, until the salsa has a very thick consistency; stir occasionally. Then set aside. Cut 1/2 avocado into strips, then reserve. Finely chop 1/4 of an onion (1.2 oz) and 1 coriander sprig; then set aside. Discard the epazote sprig that was put in the chilaquiles. 2 tablespoons of Mexican Cream. Sprinkle 2 tablespoons of crumbled Fresh Cheese. Preferably put the ingredients in the same order as given so the chilaquiles look beautiful. * There always has to be bread on the table when chilaquiles are eaten. Variation: Would you like to change the green color for red ? Did you like the Green Chilaquiles? 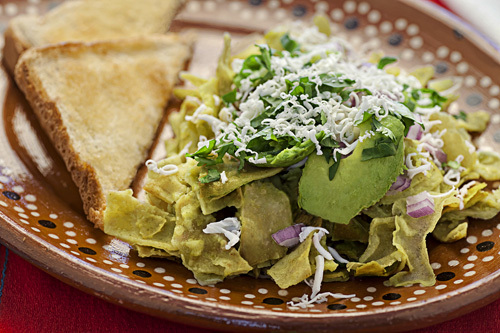 ➥ Would you like to accompany your chilaquiles with an appetizer? ➥ You have to enjoy the chilaquiles with a Mexican Drink. ➥ After the chilaquiles would you like something sweet?